My grandmother was a remarkable woman. Widowed young just after the Second World War, and armed with not much more than a fierce work ethic, she left Scotland and emigrated to Canada with her three daughters – the smallest just three. I think that took great courage. Sadly, I have none of my grandmother’s recipes. In fact, I don’t remember ever seeing her refer to a cookbook or recipe card. So the particular secret to that steak and kidney masterpiece is lost. Even in my bravest moments in the kitchen, I have never attempted to replicate it. The potential for disappointment is too great. OK, OK. But not quite. There’s something even better. 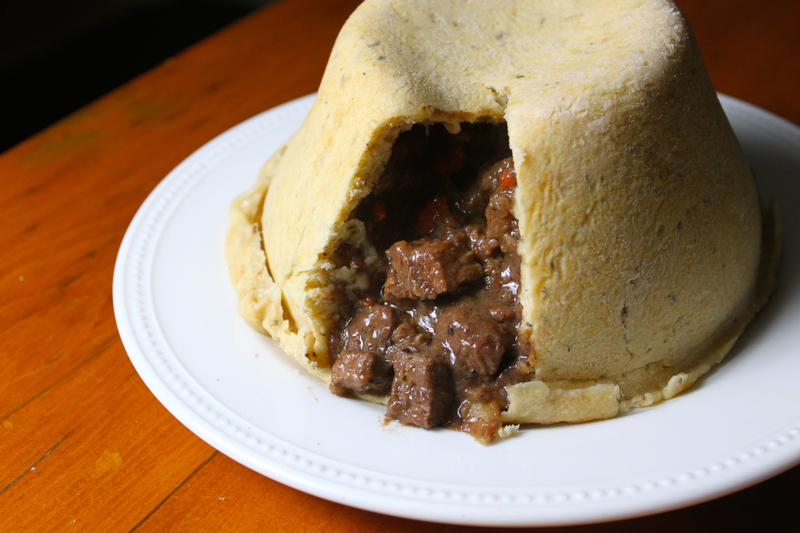 I first had steak and kidney pudding in a London pub and it was like going to heaven – except for the cigarette smoke. The same thick gravy, the same earthy smell of kidney as my favourite pie, but wrapped in a rich suet crust that’s more like a dumpling than a pie casing. Absolutely perfect. Puddings are steamed, not baked like pies. You’ll need a pudding basin to do this (found at any decent kitchen shop and useful as a mixing bowl or rustic serving dish when puddings aren’t in season). A one-litre basin will hold enough for four. After you’ve lined the basin with dough, filled it and sealed it with a dough lid, you wrap it in foil and steam it in a large pot. It seems a lot more daunting than it really is. And you’ll be very proud of yourself when it turns out beautifully. I was. I think Nana would be, too. Trim fat and gristle (all the white bits) from kidneys with a sharp knife, cut into one-inch pieces and toss in seasoned flour with the beef. Set aside. Heat olive oil in a large pan and cook the onions and carrots with the herbs until the onions are soft and just beginning to caramelize. Remove the onions, carrots and herbs and set aside. Add a little more oil to the pan if required and brown the meat in batches. Deglaze the pan with wine, then add the stock, the vegetables and the meat and simmer gently for 1¾ hours until tender. Set aside to cool. Two hours before the meal, sift the flour and baking powder into a mixing bowl and add the salt, mustard powder and thyme. With your fingers mix in the suet until flour is slightly pebbly. Add cold water in small amounts until the dough makes a firm round ball. t Pinch off a quarter of the dough and set aside, then roll out the rest to about 1/4 inch thick. Butter a one-litre pudding basin line it with the pastry, being careful not to stretch it. Fill the pastry-lined basin with meat mixture to within 1/2 inch of the top, and then roll out the remaining dough to make a lid. Rub a little cold water around the rim of the. Seal the basin loosely in aluminum foil, leaving room at the top for the pastry to rise. Put the foil bag a large large pot of boiling water (filled to roughly half the height of the pudding) and simmer, covered, for 90 minutes, adding more boiling water from time to time if necessary. Unwrap the putting, use a serving tray to invert and turn out. Enjoy. This entry was posted in Main Courses, Meat and Poultry and tagged British food, kidneys, savoury puddings, steak, suet crust. Bookmark the permalink.